Also in the Manhattan office. Danielle M. Visvader is a Partner at Abrams, Fensterman, Fensterman, Eisman, Formato, Ferrara, Wolf & Carone, LLP. When she first joined the firm, Ms. Visvader predominantly practiced Elder Law and specifically concentrated on Article 81 guardianship proceedings for both individuals and institutional clients, including nursing homes and hospitals. She subsequently expanded her practice to include Mental Health Law, dealing with the retention and treatment of patients in psychiatric facilities. Ms. Visvader also made it a point to familiarize herself with the regulations governing institutional and community Medicaid and Medicaid planning in an effort to more effectively represent her Elder Law clients. Additionally, Ms. Visvader handles other civil litigation matters and residential real estate purchases and sales. 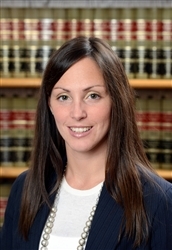 Ms. Visvader is eligible for court appointments in various counties, including Nassau and Suffolk, as Guardian,Court Evaluator and Counsel for alleged incapacitated persons, pursuant to Part 36 of the Rules of the Chief Judge of the New York State Unified Court System. Ms. Visvader has been selected to the New York Rising Stars list since 2013. Each year, no more than 2.5% of the lawyers in the state are selected by the research team at Super Lawyers to receive this honor. Ms. Visvader also received Long Island Business News’ Leadership in Law award in 2013. Ms. Visvader received her B.A. from Fordham University and her J.D. from Hofstra University School of Law, where she served on the Journal of International Business and Law and the Moot Court Association. She is an active member in various professional and civic organizations such as the New York State Bar Association, where she is a member of the Elder Law section, and the Nassau County Bar Association, where she is a member of the Elder Law section and the Hospitals and Health Law section. Ms. Visvader is also dedicated to giving back to the community through education. For twelve years, Ms. Visvader acted as the Mock Trial coach for her alma mater, Preston High School, a private Bronx high school for girls. She was recently selected as a “Rising Alumnae Under 40” by the Alumnae Association of the school. Hofstra University School of Law, Hempstead, New York - J.D.